So I totally make all my soups in my Instant Pot now. Like seriously, all of them. It’s glorious because I get slow simmered flavor in a fraction of the time, often with little to no effort on my part. If you’re in the market for one, let me be the annoying friend shouting “DOOOOO IT!!! !” from the rooftops. Since I know most of you haven’t taken that leap yet, I’m including complete stove top instructions for ya. After all, that’s how I made this tomato soup pre-IP! No matter which method you use, this soup is good! Creamy tomato soup has to be, hands-down, one of my favorite comfort foods of all time. I usually serve mine up with baked mozzarella balls, grilled cheese, or a cheesy quesadilla but lately I’ve been keeping things light with my crispy parmesan roasted chickpeas on top. LOVE IT SO! Craving a kiss of heat and spice? Try it with my zesty Shawarma Chickpeas on top! Switch your pressure cooker to the saute funtion and sauté onion in 1 TBSP oil for 3-5 minutes, until edges are golden and brown. Next add garlic and sauté for a minute more to bring out the flavor. Add seasoning (salt, oregano, basil, and (optional) sugar) along with carrots, tomatoes, tomato sauce, tomato paste, and broth. Set to high pressure for 15 minutes and allow to come to pressure, allowing a natural pressure release. Add your cream cheese and puree using a hand held immersion blender until fabulously smooth and bisque-like. You can also blend the soup, in two batches, in your blender or food processor. Lastly, give the soup a taste and adjust broth/tomato/seasoning to taste, adding any extra of whatever you prefer to get your ideal thickness and flavor. 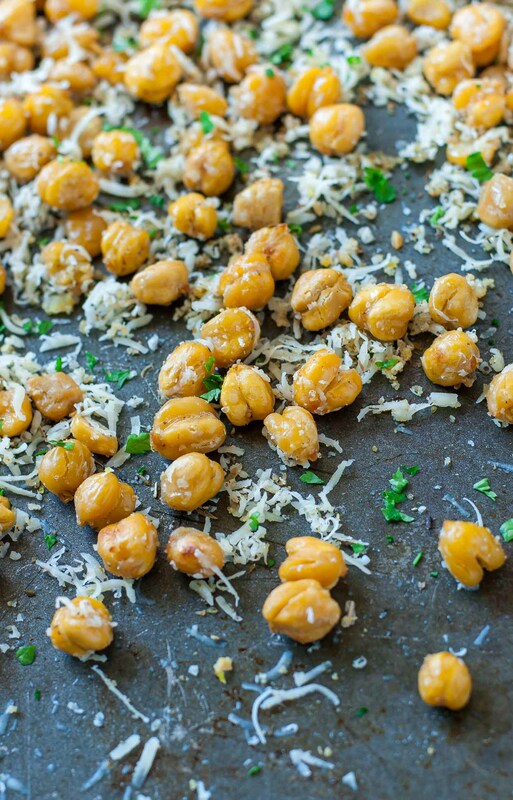 Add all your roasted chickpeas on top (and a sprinkle of parmesan if you're feeling cheesy) and dive in! Drain the chickpeas in a colander or sieve and rinse well. Pat the chickpeas very dry with a clean dishtowel or paper towels. The drier the chickpeas, the crispier your end result. If you have time, leave them to air-dry for a few minutes, and remove any chickpea skins that come off while drying. Toss the chickpeas with olive oil and salt until all your little chicka-peas are coated, then arrange in an even layer on a baking sheet. Roast on the center rack for 20 to 25 minutes until crispy on the outside and soft in the middle. Stir or shake the pan of chickpeas at the 10 minute mark for even crispiness. While still hot from the oven, toss the chickpeas with the spices and parmesan cheese. Yields approx. 2-3 large bowls or 4 smaller servings. * I add a pinch of sugar to my tomato soup to help cut the natural acidity of the tomatoes. My husband requests this little addition a lot. The carrots and cream cheese also help, so if needed feel free to skip the sugar and add a little extra carrot/cream to the mix, to taste. These are the electric pressure cooker instructions. For stove top instructions, see blog post below. If you get a chance to try this crazy tasty Instant Pot creamy tomato soup, let me know! You can leave me a comment here (LOVE checking those daily!) or tag @PEASandCRAYONS on Instagram so I can happy dance over your creations. I can’t wait to see what you whip up! Question: is it weird that I crave chickpeas? I’m talking cah-raaaaave with a capital C. It’s totally a thing right? No? Anwho! I’m writing this up while a bowl of leftover soup warms on the stovetop right now and I almost can’t fathom eating it without a tray of chickpeas. Since trying the combo last week I am head over heels obsessed with the combo. The lusciously thick and creamy soup topped with crispy-yet-chewy seasoned chickpeas… GAH! I suppose I should pre-heat the oven, eh? No pressure cooker? No problem! This soup cooks up easily on the stove with just a few simple steps. In a large stainless steel pot or dutch oven, sauté onions in oil until tender. Once the onions are translucent, add garlic and sauté for a minute more to bring out the flavor. Season with salt, oregano, basil, and (optional) sugar. Add carrots, tomatoes, tomato sauce, tomato paste, cream cheese and broth. Simmer on low for 25 minutes until the vegetables are tender and the flavors have shacked up together. Next, puree using a hand held immersion blender until fabulously smooth and bisque-like. You can also blend the soup, in batches, in your blender or food processor. If using a blender/processor, let the soup cool slightly before blending for safety. Serve piping hot topped with crispy parmesan chickpeas. The leftovers for this Instant Pot creamy tomato soup are phenomenal! Like with most tomato based soups the flavors are somehow even better the next day, which makes prepping grab and go lunches for work or school a total breeze. Make the chickpeas sans parmesan (you can store a little cup of grated parm in the fridge to take along with your soup if desired) and they will keep in an airtight container on the counter for a few days. 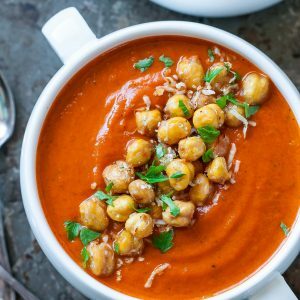 The chickpeas are always crunchiest straight off the pan, so expect your leftover garbanzos to be more chewy and tender, but still super flavorful and great with this soup! 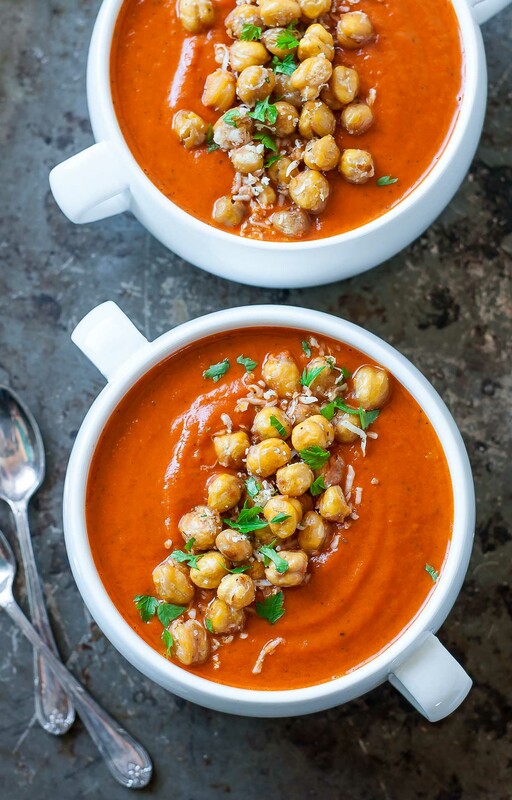 Hope y’all LOVE this Instant Pot Creamy Tomato Soup with Crispy Parmesan Chickpeas! Buffalo Chickpea Salad – YES! Sweet and Sour Thai Carrot and Cucumber Noodle Salad – READER FAVORITE! I loved this soup. I did not use the oregano only because I personally hate oregano and I added 2 oz more cream cheese and it was amazing! Thanks ! Can I double this and make in my 6quart Instant Pot? Hi Cindy! Let me know if you give it a trial run? My only concern is whether or not it will be past the max fill line? If it’s too full it can burn and will activate the auto-shutoff feature on the IP. This soup is absolutely one of my favorites!!!! Will be making this a lot! How much would the flavor profile change without the cream cheese? We are a dairy-free home, due to allergies. Do you think coconut milk would work instead or could it be omitted altogether? Thanks! Hi Patty! The dairy cuts the acidity of the tomatoes and adds a little creaminess which the coconut milk can totally do as well! (loooove me some coconut milk!) I would suggest starting by omitting entirely, give it a taste, and then swirl in the coconut milk if desired – starting with a little and tasting as you go. It should work both ways! The chickpeas are parmesan dusted but those are also wonderful without the dairy – you can even add a little extra garlic! 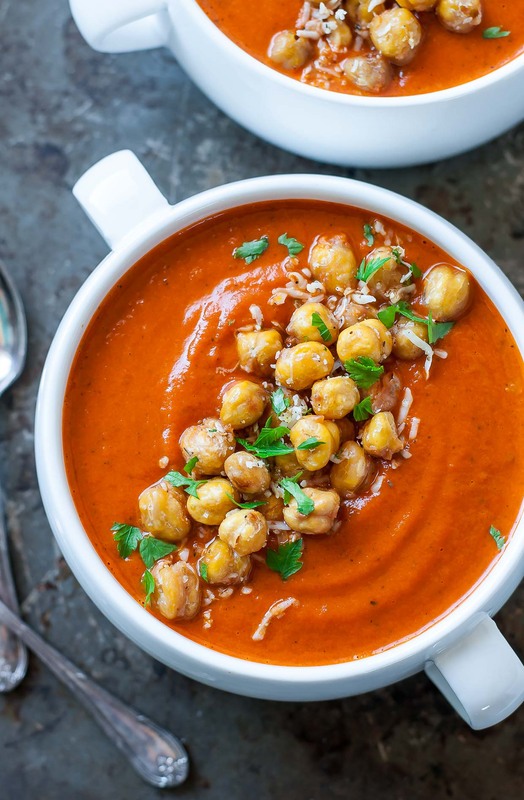 I also have a fire roasted tomato soup here on the blog that is dairy-free! What’s the nutritional content on this recipe? Thank you! Hey Amy! I’m working on getting my whole site calculated but it’s looking like I won’t have a lot of me-time until the kiddo starts school at the end of the Summer. To get the info in the meantime you can enter it into MyFitnessPal.com <-- it's free and my favorite calculator right now! Will this fit in a 3qt Instant Pot Mini? Love this recipe. Even my husband loved it. The chickpeas were a nice added crunch and flavor. I will be making this again. Paired this delicious soup with grilled cheeses for dinner! It’s so easy to make and full of flavor! Thank you Parita! Grilled cheese sounds like the perfect combo! This soup was amazing! I have tried to make something that we like as much as Panera’s tomato soup for years and this was sooo good! I will definitely be making this again! Can you double this recipe in a 6qt instant pot? I did that and it fit! This soup was fabulous!!! And the chick peas just take it over the top! Thanks so much for the yummy recipe. I am in LOVE with this soup and really rather obsessed with it. The flavor is outstanding and the chickpeas on top – to die for! And I thought I only liked chickpeas in hummus!! Love it!! Do you put the cream cheese in with the tomatoes (in the IP step 3) before pressuring? Hey Samantha! At the end before blending. Cream and cheeses don’t pressurize well and curdle, so they’re best at the end swirled into the piping hot soup 🙂 Hope you love it as much as we do! I just made a New York style cheesecake in my IP and it turned out great. Maybe because it was cooked in a pan rather than mixing the cream cheese in with wetter ingredients. Regardless, I can’t wait to try your recipe as tomato soup is a favorite and this recipe sounds delicious. Aw thanks Maryea! 🙂 I’m obsessed with mine too – it’s so handy on busy weeknights! Help! I totally bought into the instant pot craze and bought the Powert Pressure Cooker XL at Costco, and everything we have made in it is incredibly bland. Today we made a whole chicken with sage, rosemary, sautéed onions and garlic, etc. and when I opened up the pot it tasted like boiled chicken. Literally no flavor. Do you have any advice? No one else seems to have that problem! We have followed recipes from the instruction manual as well as just flew by the seat of our pants – everything we cook tastes like nothing at all. I’m in an Instant Pot group on Facebook (the official one for the appliance, totally a great one to join no matter which pressure cooker you own!) and I hear this complaint a ton! I’ve heard the issue is that the flavor from spices and aromatics get so completely absorbed that you need to add more than you normally would. Some people add extra to the pot and some just add extra to taste once the dish is complete. I usually do the latter but I’ve found that soups are really good at holding flavor in the PC.